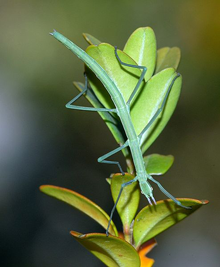 Spanish Walking Stick insect (Leptynia hispanica). Numerous species use deceptive appearance to escape the notice of predators and/or prey. This evolutionary tactic is an example of passive deception, because it is an effort to mislead in order to conceal intentions, attributes, or capabilities that the deceiver possesses. Active deception, by contrast, consists of efforts to mislead in order to create the impression of intentions and capabilities that the deceiver doesn't actually possess. Photo (cc) Fritz Geller-Grimm and Felix Grimm courtesy Wikipedia. We began to explore pariah professions last time, when we defined them as professions regarded within the enterprise as "outsiders." That view needn't be universal. That is, the people in Finance might regard the people in Engineering as "less than" because, as the people in Finance might say, "the engineers are more concerned with adding new features than they are with generating revenue." The Engineers might have similarly low regard for Testers, but the people in Finance might be neutral about Testers. A profession that is a pariah to one group might not be a pariah to another. When one profession regards another as a pariah, the disregard can be symmetric. Pairings that often have low regard for each other include Engineering with Finance, Marketing with Product Development, Product Development with Product Testing, Doctors with Nurses, and Attorneys with People Who Aren't Attorneys. And in some organizations, for people looking for a pariah, there's always Tech Support. In the society at large, social outsiders often lead lives of relative economic deprivation. In organizational life, the economic extremes can be much less pronounced, but compensation is often correlated with pariah status. In organizations that permit some professions to regard others as pariahs, people exhibit behaviors that limit organizational potential. Here are two classes of behaviors related to information management. When representatives of a pariah profession encounter opposition as they attempt to carry out their duties, some might resort to passively deceptive tactics, which are efforts intended to prevent detection of actual capabilities and plans. For example, employees of a financial control unit might entertain appeals for policy waivers from some politically powerful parties, while other employees of that same financial control unit — possibly even the same employees — assert to other less powerful parties that waivers are never granted. Passive deception can be a tempting expedient in dealing with opposition. Still, its effects are caustic and durable. disregard can be symmetricemployees conceal information from members of pariah professions who need that information to properly carry out their responsibilities. The concealers feel justified, because they perceive the pariah's behavior as subverting organizational goals. This behavior can be symmetric; members of pariah professions also conceal information if they feel that they will be hindered in carrying out their duties if the information is made available internally. These behaviors are especially toxic, because they only add to the tension between the pariah profession and other professions. Would you like to see your comments posted here? rbrenTLILhLarAZaBqQyHner@ChacrTaDBwyrQporROYcoCanyon.comSend me your comments by email, or by Web form. See also Conflict Management and Workplace Politics for more related articles. I offer email and telephone coaching at both corporate and individual rates. Contact Rick for details at rbrenROwIsGqhwjAvsORKner@ChacIJjlCRiNJXuBwKisoCanyon.com or (650) 787-6475, or toll-free in the continental US at (866) 378-5470.